Put all the ingredients in a blender (ice cubes on top) and blend on high speed until smooth. 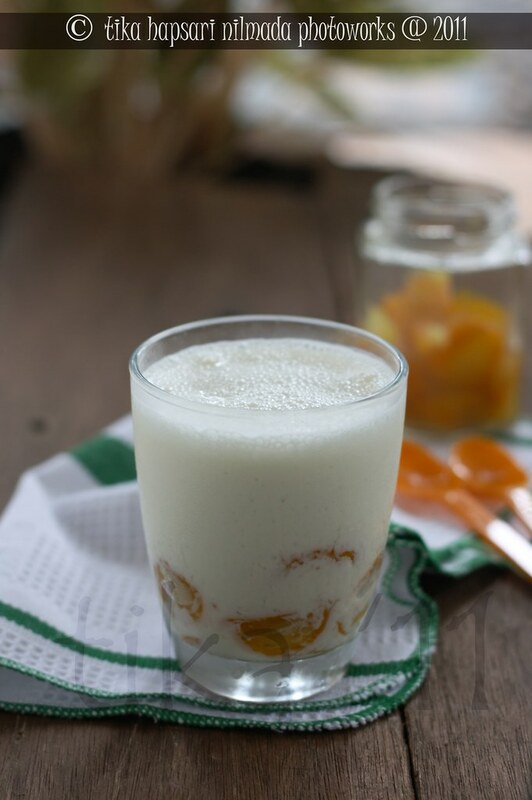 Put kumquat compote in a glass then pour the yoghurt to the glass. Serve. "Easy peasy lemon squeezy" are the right words to describe this stir fry. You could make many variations with it by adding shrimp paste or perhaps you want it a little bit spicy, add scallop or salted dried tiny silver anchovies to the stir fry. If you like to do experiments, I believe it's about time ! Aside that this stir fry is quick preparation and cooking time needed, it also doesn't need too many ingredients. 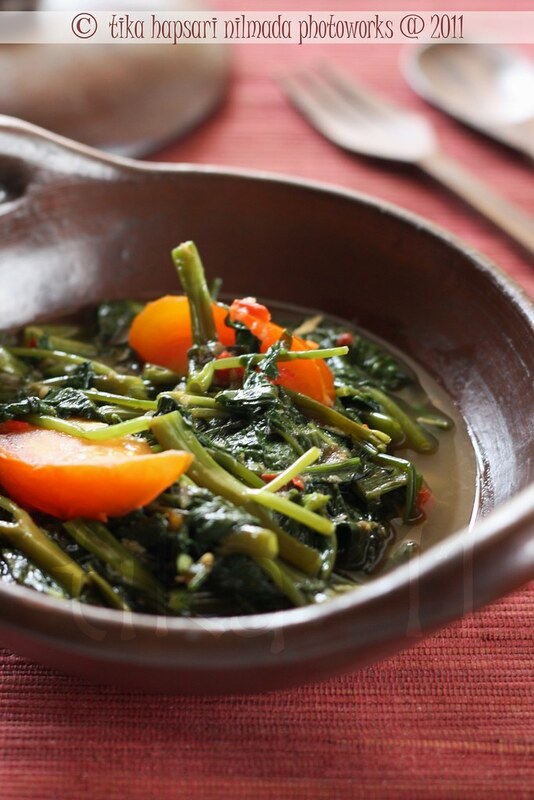 So, stir fry water spinach is one of many simple stir fry I'll make when I only have limited time to feed my hubby and my son. Best serve with warm rice, sambal terasi and deep fried tempe. Indonesian style... !! REMINDER, you still have few days to send your photos to DMBLGiT July Edition. You better hurry up ! 1. Wash and cut water spinach properly. Let it drain. Set aside. 2. Ground chilies, shallots, garlic, shrimp paste, salt and sugar. 3. In a wok, heat the oil. Stir fry ground spices until fragrant. 4. Add in water spinach leaves, stir well. Add water, mix until done. 5. Add sweet soy sauce and taste it. 6. Add in the tomato, stir rapidly then remove from the heat. 2. Haluskan cabai, bawang merah, barang putih, garam, terasi dan gula pasir. 3. Panaskan minyak dalam wajan. Tumis bumbu halus sampai harum. 4. Masukkan kangkung, aduk rata. Tambahkan air, masak hingga layu. 5. Tambahkan kecap manis sedikit, koreksi rasa. 6. Masukkan tomat, aduk sebentar lalu matikan api. 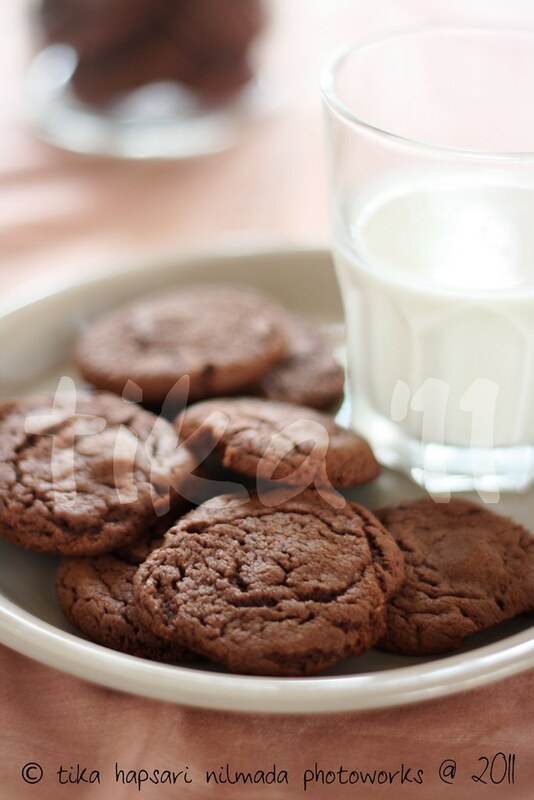 Blogwalking to Jamie Oliver's web and I found this Chocolate biscuits with soft chocolate centres recipe. He's such a talented man ! I want to try every chocolate recipes he has on his personal web. I modified the shape of the biscuits since I don't have cookie cutter. Never mind about the shape, I believe the taste of the biscuits is as good as Jamie's :D (same recipe, remember ?) 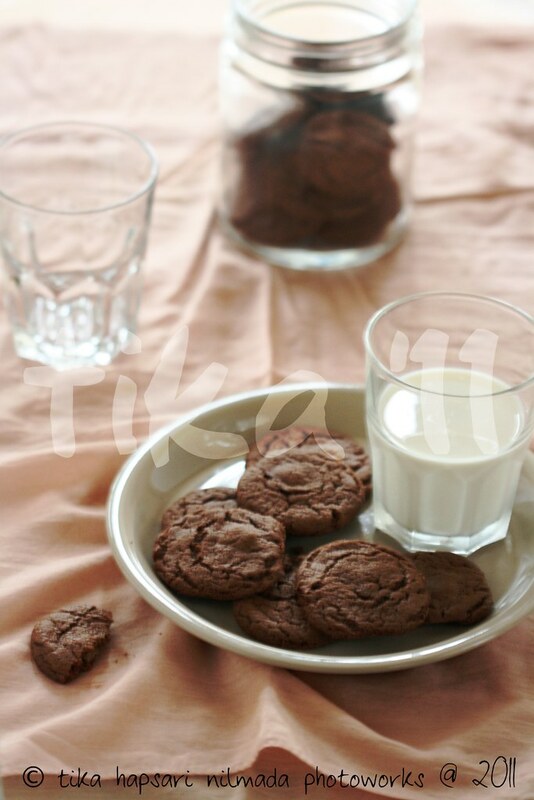 The chocolate milk inside the biscuits give you the different texture, chewy and crunchy at the same time. You could keep the biscuits in the fridge to make the biscuits stay crunchy. Don't forget, I'm the host of DMBLGiT July Edition ! The event is still open until July 20, 2011. I'll be here waiting for your beautiful food/drink photos. Have you send yours yet ? 2. Cream the butter and sugar together until pale. Beat in the egg yolks, then add the flour and cocoa powder to make a dough. Turn out and knead, then pop it into the fridge for a while. 3. Take the dough and shape into balls each about 25 gr. 4. Roll the ball dough and put a square of chocolate in the middle – make sure you use all the chocolate however many you do. Shape it into ball again. 5. Cook in the preheated oven for 10 minutes, and eat them hot or cold. 2. Kocok mentega dan gula sampai mengembang. Masukkan kuning telur, kosok rata. Lalu masukkan tepung terigu dan bubuk coklat sambil diayak. Matikan mixer dan campur dengan menggunakan tangan. Sampai membentuk adonan yang tidak lengket di tangan. Setelah itu masukkan kulkas. 3. Setelah beberapa saat, bulatkan adonan kira-kira seberat 25 gr masing-masing. 4. Tipiskan adonan, isi dengan coklat yang sudah dipotong kecil-kecil (coklat bisa dicampur. Lalu bulatkan kembali. 5. Panggang selama 10 menit. Angkat dan dinginkan. Over the last 18 months, I have entered a handful of DMBLGiT events. ... and today I feel honored and exited to announce that I am the host of the popular food photography event Does My Blog Look Good in This ? (DMBLGiT?) July Edition - a monthly food photography event for food bloggers and food photographers everywhere - that was started by Andrew of Spittoon and Spittoon Extra. Big thanks to Andrew for managing this long-running contest and allowing me the opportunity to host this month. (If you are interested in hosting the event, please email Andrew with "DMBLGiT Host" as the subject). Before we go any further, I'd like to introduce the judges on the judging panel first. They come from different countries ! Pepy Nasution, is an Indonesian lives in Winnipeg, Canada. 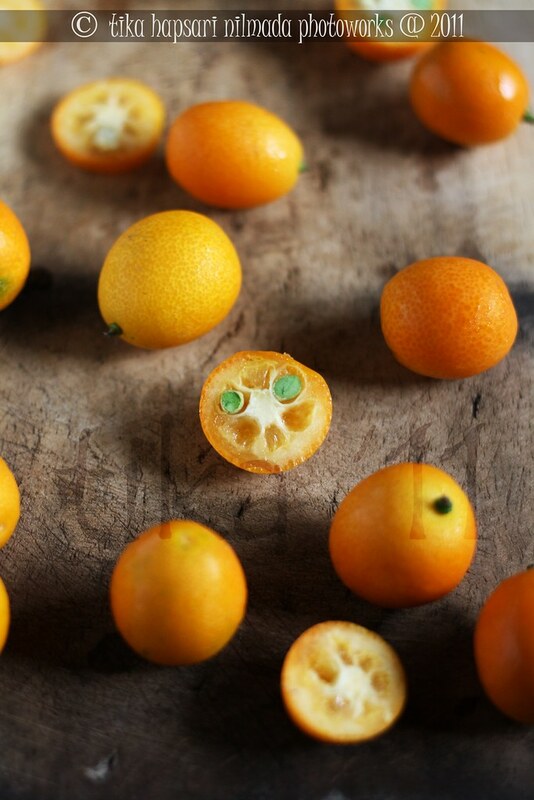 She shares (mostly) Indonesian recipes with her beautiful photos on her blog Indonesia Eats. A food blogger whose passion on food you can always feel from her posts. As she mention about her blog "this blog is very much filled with nostalgia". I'm also amazed on how she can fulfill her craving of Indonesian foods while she's far away from her motherland :P She's also the admin of Taste of Indonesia in Food Photography. You may find her works on Flickr. Dario Milano, is a professional Food Stylist and Photographer who has won on DMBLGIT July 2010 and DMBLGiT December 210. He's been very nice by managing Food Photography Critique and Food Photography Contest on his blog Food Pixel. He also kindly shared his tips on food photography. If you interested in food photography, you can grow with him ! His blog, his tips, his critiques and his food photography contest. Sylvie, a freelance photographer from California, USA, with food photography as her specialization. One of many nice friends I met through Flickr. 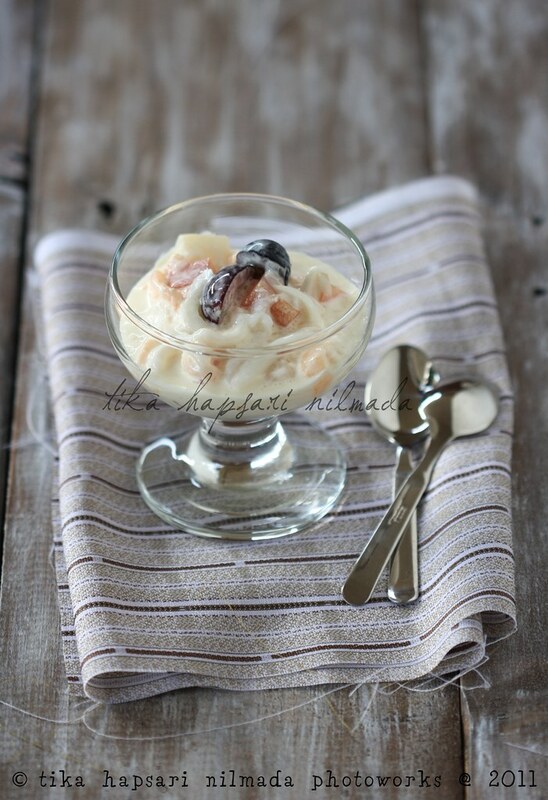 Her food photos are always inspiring as you can view on her blog, Gourmande in the kitchen. All I can say about her works is "she has unique style, beautiful light and have dark mood in most of her photos" and I will recognize it immediately that it was hers. View her photostream on her Flickr to find more of her recent works. Carlina Teteris, is a traveler and she loves taking picture of dead fish ! Based in Singapore but has travelled to many places make her living like a nomad :D She's a great photographer as you can see her works on her Flickr. She definitely knows how to capture the local beauties (food, people, culture, landscape, anything) while on her travel. Everything comes alive. She also blogged her story on her blog Carlina Teteris with beautiful photos. For me, her blog is more like a written colorful journey. - Aesthetics : composition, food styling, lighting, focus, etc. - Edibility : "does the photo make us want to dive in and eat the food ?" - Originality : the photograph that catches our attention and makes us want to say "wow! ", displaying something we might not have seen before. - Overall Winner : top three scores in all three categories combined. There are three overall winners for photographs with the highest point totals in all three categories combined, and one winner in each of the three individual categories. What do you have to do to join the event? Please send photos in an attachment to your email in a jpeg format, of no more than 500 pixels in width. By submitting a photo, entrants agree to their photo being redisplayed and altered in size on my blog and on the Spittoon Extra DMBLGiT ? page. All submissions will be posted to the July 2011 DMBLGIT gallery, which will be updated as I receive entries. Please give me a few days to update the gallery with your submission. And make sure yours is included once I start publishing them. I look forward to your entries. Good luck!
. :: Tika Hapsari Nilmada ::. I made this salad especially for my Flickr friend, Marico Marvie from Philippines. As I promised to her, I want to make Buko Salad, take a photo of it, write a post for her blog and then send them to her. I volunteered myself to Marvie and she was agree with my idea. It was my first time doing this, write a post for someone else's blog. But it was fun ! I do want to have someone write something for my blog too. 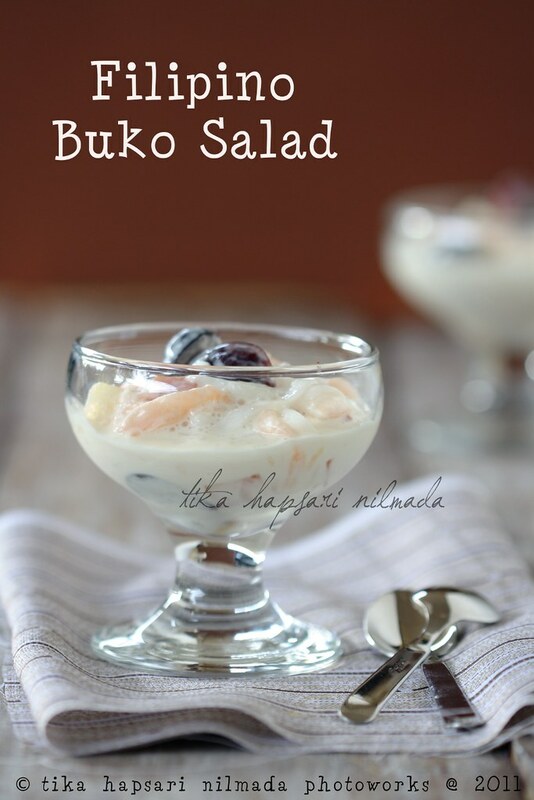 So, Marvie already posted my Buko Salad recipe on her blog Lekkericious. Please take a peek and you'll find another healthy recipes from her blog. But don't be surprise if you find posts about cats (please, she don't eat cats !). She's a truly cat lover and cat rescuer. I believe she's soft-hearted when it comes to abandoned cats. In this post I only give you the recipe in Bahasa Indonesia. For the salad itself, so fresh, easy, I love the taste but not cheap..hehehe... (heavy cream and 1 can of cocktail fruit are not cheap though). You should try it ! The photo above has been criticized by Dario Milano from Food Pixels. Read the detail here. Campur semua bahan jadi satu dalam mangkuk, aduk rata. Dinginkan di dalam kulkas. Sajikan dingin. The logo above is from "Salad Spead" event hosted by Anamika Arun from Taste Junction. 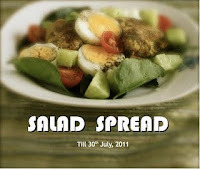 You still can submit your salad recipe to her by reading the details on her blog.